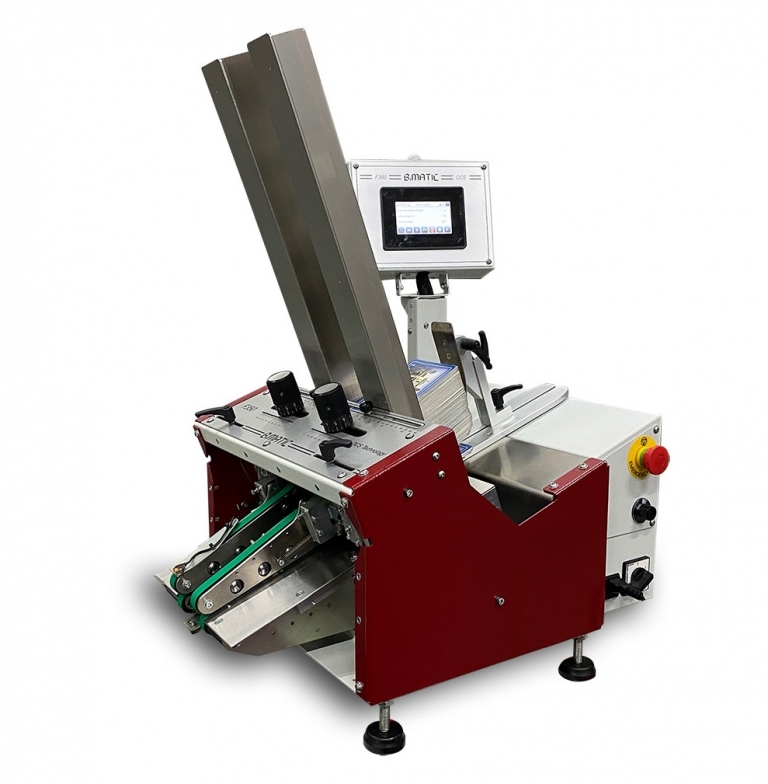 The new friction feeder counter by B.MATIC to count envelopes, cards, labels and many other flat products items. It is equipped with OCS original technology for friction feeders to change the belts in 3 minutes! It is a sound friction feeder for professional use and state of the art technology realized in the B.MATIC way. Can be fitted with optional barcode scanners for security applications. It is available also the version named "F350 FEEDER S" which is not used as a stand alone counter, but as a feeder for single or multiple sheets controlled by external pulse. F350 Counter "S VISION", the new Friction Feeder with OCS technology. F350 is the evolution of the previous F320 model with the already established OCS technology. Improved both ergonomically and functionally, it has an input size of more than 30mm compared to the previous version and is more compact (narrower than 10mm and much shorter than 300mm). The rotatable display offers greater data visibility and better accessibility to the buttons. It is also more flexible, allowing the housing of a greater number of sensors, with external connections for both activation and error reporting (see technical data). F350 COUNTER "S VISION" fees and inspects the product for quality control, security counting, barcode and matrix code applications in product tracking and mailing. F350 Counter S Marker is B.Matic new friction counter, equipped with OCS technology (Opposing Cantilever Shafts) and a marking head with high resolution 600 DPI cartridge(s). Besides counting products as labels, envelopes, credit cards, tickets, pamphlets and many others, this model allows to impress numbers, linear and bidimensional bar codes or logos. F350 Counter S Marker is a sound and reliable machine, intended for professional use. Compact friction feeder equipped with OCS technology; mechanical unit with motor to be controlled by external electronics. The ideal solution for packaging lines, it includes double sheets proximity sensors and counting photocell. Includes the complete mechanical system common to the F350 line, but without control electronics. It must be activated and controlled by the external electronics from the packaging line. Its compact design makes it perfect for integration in limited space. Here below a brief gallery of case studies on F320. Many others products are counted/fed perfectly by the versatile OCS (Opposing Cantilever Sheets).